Las Vegas drive thru wedding ceremony with Elvis as your chauffeur. 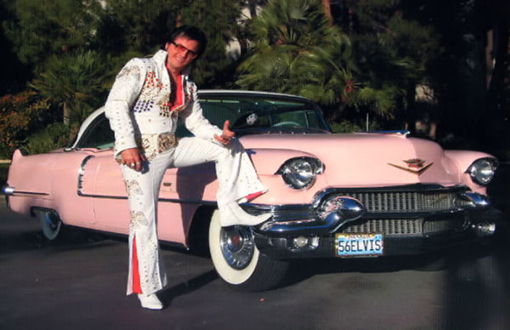 Elvis will pick up Bride, Groom and up to 3 guests, in his 1956 Pink Cadillac, take you to our drive through wedding window where you will have your wedding ceremony. The King will perform 3 songs during your wedding ceremony. Elvis will then take you back to your hotel. For the couple that wants to have some fun and tell their friends they got married with Elvis at a "Drive Thru" wedding window in Las Vegas. Daytime or evening weddings available, 9:00 a.m. - 10:00 p.m. 7 days a week. Ministers to perform vows this location. Ministers work for donations, $50 and up suggested. Limited pick up area, Strip vicinity (Las Vegas Blvd.) and Downtown hotels. If unsure if your hotel is in Elvis' pick up area please call. Prices do not include tax. Add $7.00 for shipping of photos and $9.00 fuel surcharge if guests use limo.